The mask will be comprised of two major layers. The top, a hard shell, will protect a patient’s face and also store electrical components. 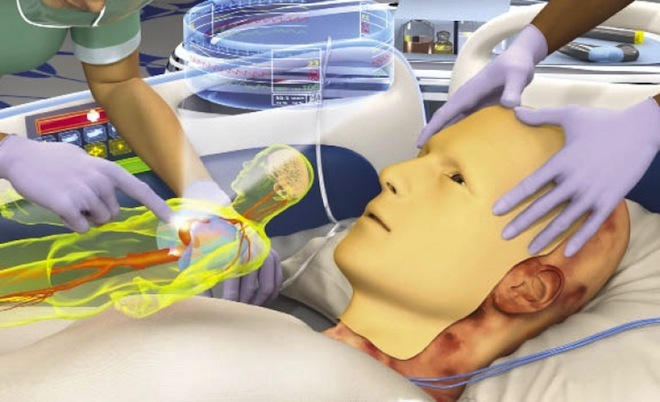 Underneath, a flexible polymer mask will fit around the contours of a patient’s face. It’ll be embedded with three more layers: An array of sensors to track the rate of healing, actuators to push up against the wound and hold the mask in place, and a network of micro-tubing and valves to pump therapeutics — whether antibiotics and pain killers or stem cells and growth factor — onto specific regions of the wound.